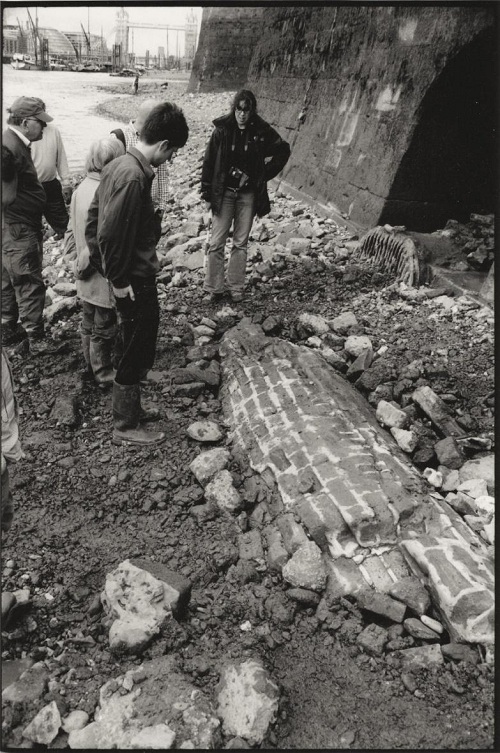 The FROG team working just below the Wapping entrance to the London Docks uncovered what appeared to be a brick culvert embedded in the foreshore, a few feet above present-day low-water level. It appeared to be constructed of two thicknesses of brick and have an internal diameter of about 600mm to 750mm. The alignment was along the river, not at right angles to it, so it seemed not to be part of a system of drainage directly into the river. None of us present knew what it had been. My guess was that it had been part of the temporary drainage system installed to cope with rising ground water and leakage through the caissons or cofferdams built to hold back the river while the walls to the lock and river frontage were built. Smaller bore pipes in cast iron would have picked up water from the further parts of the excavations, coming together in progressively larger bore pipes until brick was needed to give a sufficiently large diameter. 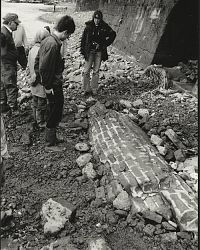 This final brick pipe would have brought water to a pit on the river front from which it could be pumped out into the river. Such an installation might have been in use throughout the construction of the dock. I decided to see if there was any information available in London which would confirm this thesis, deny it, or suggest another one. I have looked to the resources of the Museum of London in Docklands, the Institution of Civil Engineers, the London Borough of Tower Hamlets, and the London Metropolitan Archives. I have reached no very firm conclusion. The cumulative effect of this material, particularly the site reports, is to give some support to my theory but well short of a proof, and no stronger alternative is evident. The Unknown remains just that. 1 A W Skempton: Engineering in the Port of London 1785 – 1808 in Newcomen Society Transactions Vol 50. 1978 – 79. Seen at the ICE. 2 Ref 488 0028, 488 0029 1872: London – Wapping Entrance Pierhead Sewer Shaft; ref 488 0030 1872: London Dock Superintendents House: Sewer Flap.